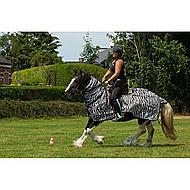 The Horka anti-fly riding rug with fixed neck and saddle saving is suitable for horse riding. 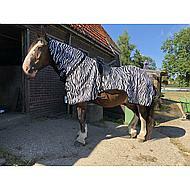 The blanket is made of a fine mesh fabric (100% polyester) that stops flies and other insects. 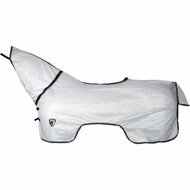 The chest, tail flap and neck section are nylon-lined against abrasion spots. 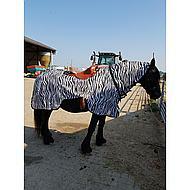 The blanket has a fixed neck that can be attached to the top of the bridle. The neck can be closed with three velcro fasteners. The blanket has a double buckle closure on the removable buttocks. 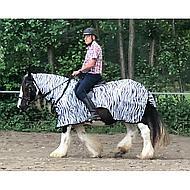 In addition, the blanket has a large saddle recess and a recess under the belly for the legs of the rider. It is recommended to wear the brackets for the blanket. 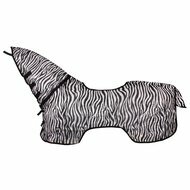 Available in white and zebra print. Nice lying blanket. Very suitable to keep the horse away from the skin of your horse. The blanket slides little so that a long ride is easy to do. Blanket stays well while driving, my outings really helped last summer! Very handy to get rid of the insects in the summer! Answer: Here you can possibly do the reins or reins. 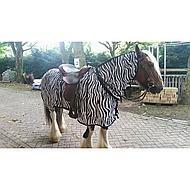 Answer: The blanket is made specifically for riding and has a recess without dust. Answer: First the saddle and then the blanket. You can also place the outer sweat sheet over the blanket.